Tuesday begins early at the Bungoma Tourist Hotel, where we wake up wondering if during the night we’ve contracted Malaria, then decide not to think about it. Travis and I vote on whether or not to risk the “shower of horrors” (see my earlier blog “Heartbreak Hotel”) and decide that it’s early in the week and we can skip the shower today. Later, no one in the van complains, which means either that everyone else skipped the shower also, or we just don’t smell that bad, yet. The week is still young. A mercifully-short-but-tooth-loosening-drive down rural roads to the Eruli I School finds us rolling by the fenced and gated compound of said school in less than an hour. The instant we are seen, it is as if the schoolyard explodes in a frenzy of gleeful shouting and waving, hundreds of children reacting to the mere sight of our minivan matutu and LandCruiser convoy as if this is the day they’ve been waiting for all of their lives. And it is a red-letter day for them, because they know that today Dr. Milton Jones is coming, Dr. Milton Jones who bears both a huge burden and a huge responsibility for their well-being, and who is esteemed so highly here that even some of the children bear the names “Milton” or “Jones.” We will also meet Wycliffes, Wesleys, and Augustines, names that bear testament to the great figures of Christian faith. Africa has been the destination of missionaries for hundreds of years; the residue of their imprinting still resonates in Africa. There’s also an “Elvis”; his name is a testament to something else…… Dr. Milton Jones is a celebrity in these parts, and for good reason. 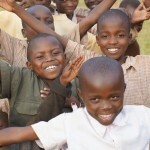 Of course, the daily blessings these children live by and through come from many hundreds of faithful supporters in the USA, loving sponsors who accept responsibility for the basic welfare of a child or several children. 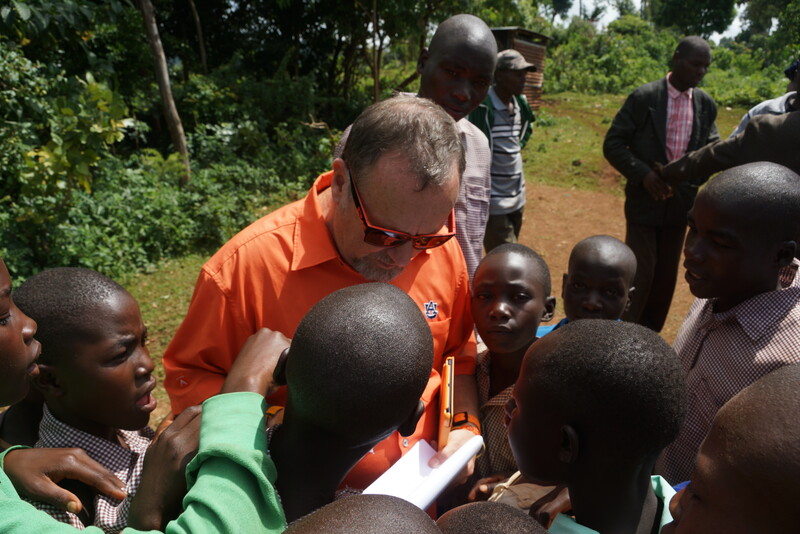 But in these parts and at these schools we will visit this week, Milton Jones is the face of CRF, and a catalyst that God has used to do some amazing things for ever-increasing numbers of Kenyan children, as well as others around the world. CRF has been doing great things for orphans for decades; Milton will tell you that he was simply put in the right place at the right time to get hit by the train of God’s sovereign work. At any rate, his willingness to care up-close has made him a celebrity here, and since we are with him, we are treated like celebrities as well. As we are herded toward the assembly hall, I feel a bit like a groupie. In Kenya, as we will more than learn over the coming days, there is a great deal of formality in the welcoming of guests. Almost as soon as we get out of our vehicles, a general assembly of the 300+ students is convened. We walk into a large building made of mud bricks, then later covered with smooth stucco; wooden trusses hold up shiny corrugated tin roofs. These are newer buildings, not modern by our standards, but still substantial, well-built, and very functional–part of the catalyst of progress required when radically embracing the challenges of taking care of children and educating and feeding them. This room is full, with a little space at the front where our team of about a dozen is seated in white plastic chairs. These are places of honor, indeed. We sit perpendicular to another group lined up along the adjacent wall, the faculty, who are in my opinion, the real stars of Eruli. 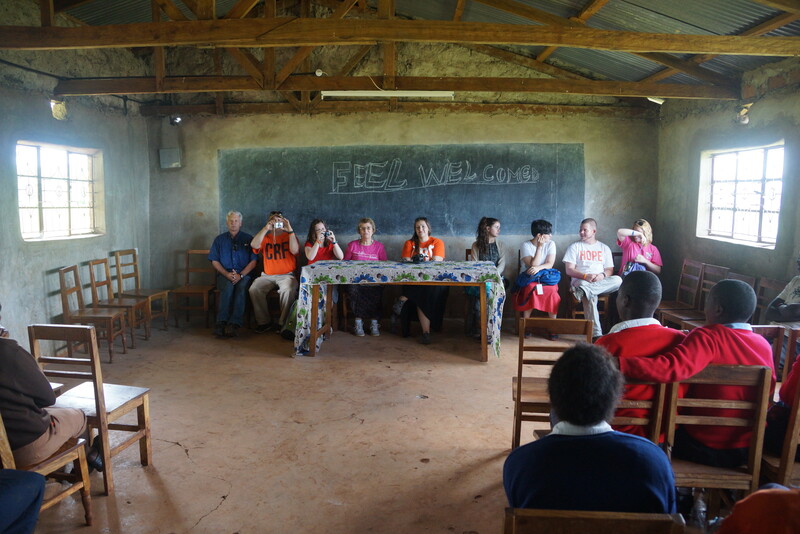 The headmaster welcomes us, the entire faculty introduce themselves one by one, and then Milton is invited to speak. The room comes to a hush as the revered Dr. Milton Jones, clad as always in orange, takes the center stage; they listen without a sound. They listen much better than American children! After Milton speaks there is thunderous applause and then each of us is expected also to speak a word of introduction and greeting or encouragement or affection for the children; we’re new at this and a bit reluctant, but we catch on quickly. It takes a long time. 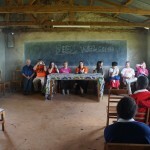 We are dismissed to walk a bit around the school grounds, touring the facilities and taking in the lush African scenery. The classrooms are basic, but clean and over-filled with wooden desks. There are well-used chalkboards painted on the walls here, and metal window frames with just an occasional pane of glass to prove potential. These rooms lack electricity, heating or air conditioning, as these kids are tougher than American children! On the walls are age-appropriate posters and charts, mostly hand-made, with alphabets and language vocabulary equivalents and numbers and animals and colors—much like you’d expect to find in any primary classroom. Their classes are “teacher-centric”–devoid of most aspects of trendy Western educational philosophy. The teachers teach and the children are expected to listen and learn, somehow, even without iPads! And learn they do, with scores that rank these private Christian schools as some of the best schools and best students in all of Kenya. Eruli is set in a tropical environment, just a few clicks north of the equator, and the plants show it, jungle-like in their size and hardiness. A “First Freeze Contest” would miss the mark here! Banana trees are everywhere, filled with their ripening burdens and hyperbolic blooms, and everything else including the school farm is in hypergrowth mode during this almost-rainy season. We “veestas” mingle with children, who are delighted to see us and swarm whenever candy is seen, and then we walk among the rows of kale and corn that will become sikuma wiki and ugali, staples of the African diet. Before long we are called to tea, a British holdover ritual that exudes formality and civilization, beginning with the washing of hands. An experienced member of our tour warns us not to eat too much of the fruit and snacks, because they will be feeding us again in just an hour or so. As tea ends, we wash our hands again and then are quickly called to another assembly in which the children will perform various poems and songs and dances. The earlier assembly was only a “warm up” and now we will get down to the real program. As this is our first taste of a coming smorgasbord of “welcome visitors” (or “veestas” as they sing it), it is new and exciting. The children are incredibly talented, and their singing is unforgettable, piercing the air and vibrating the metal roof above our heads. They are bright-eyed and healthy an d joy-filled, the anti-thesis of the “starving African child” on the TV hunger-relief ads; they perform with an energy that makes me think they could do it for hours. They do, in fact, do it for hours–and it takes a long time. After the last group performs, we are expected, once again, to all speak and offer our commendations for their efforts. Milton goes first, we follow, then after the process, the children are dismissed and we exit into a sea of hundreds of beautiful African kids who want to talk to us, touch us, have their pictures taken by us, or if lucky, get some more of the candy we are handing out. (You have to be careful with this part; one of our group, Benny, pulled out a large sack of gum… he created a small riot and I was worried for his safety!) I have come armed with PEZ; I am looking for some of the smallest ones, the ones who keep off to themselves. I sneak half a PEZ package into their little hands; it is fun the watch the delight in their eyes when they see what they have. More often than not, they will be sharing it with the other children soon. The morning now spent, lunch is served, another formal event preceded again by the washing of hands. We are fed like kings in a feast at the local founder’s home, a man named Emmanuel, who is responsible for the existence of these schools. I will write about him more later but for now I’ll just say that he is famous here as well, and it seems a great honor to even be in his house. 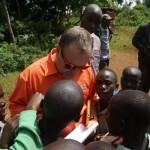 He is the reason for the Eruli Christian Schools; Eruli stands for “Emmanuel’s Rural Light”. Emmanuel is highly regarded by both students and faculty alike. He is a man of great compassion towards what is in Kenya, and a man of great vision for what might be. He sees the education of children, spiritually and physically, as the key to changing the future. Lunch takes a long time. In the afternoon we hurry off to another school down the road, a much smaller, newer Eruli High School; for some reason, we seem to be late in arriving everywhere we go. 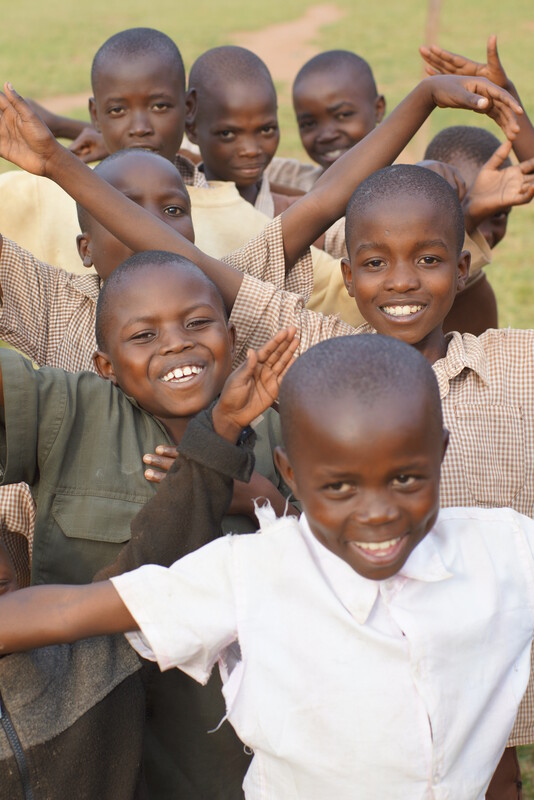 Because the primary schools are doing so well, it is now becoming a large focus of CRF to provide secondary schools into which the younger students can progress. Here we tour the grounds and see two large dormitory buildings and a dining hall under construction, and then are ushered into assembly for another 2 hours of very formal, high protocol meetings with students and faculty. They end with their gift of a rousing musical and dancing production; I am awed by their energy, talent, and joy. It takes a long time. Where to stop this blog of this day of meetings without end? I’m thinking back to our very first assembly of the day. As each faculty member stepped forward to address the group, he or she began with a phrase: “God is good.” The assembled children respond as one: “All the time!” The teacher continues: “All the time.” And the children together say, “God is good! That is His nature. Wow!” We heard this over and over, a phrase and concept obviously imprinted deeply in the hearts and minds of these children. If in their abject poverty and daily need they can believe this is true, why is it so hard for us to understand the same basic truth?